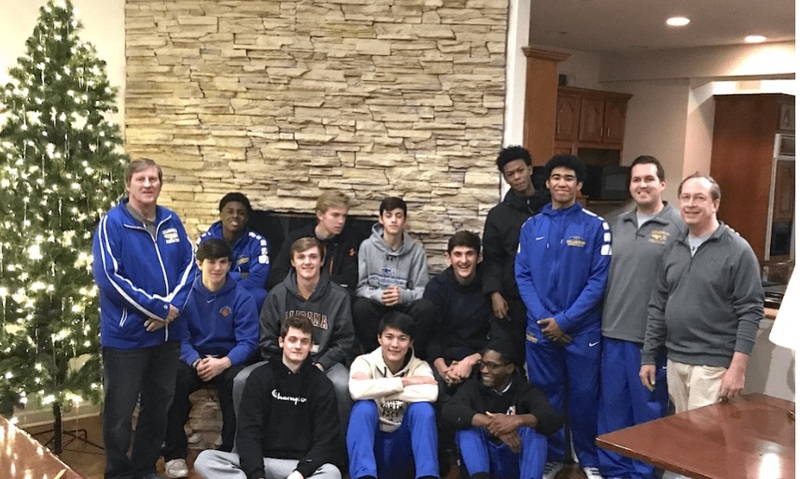 On Tuesday, November 27, the Kellenberg Boys Varsity Basketball team traveled with Bro. Michael Gillen, S.M., Coach McCutcheon, and Coach Lyons to Kellenberg Memorial’s new retreat house in East Islip named Stella Maris. The name of the retreat house comes from a name that is used for Mary, the Mother of God. Stella Maris means Star of the Sea. Coach McCutcheon explained to the team that the purchase of the property of over 5 acres was to provide a new retreat house to accommodate the school’s extensive apostolic work as well as to provide a home base for the school’s newly created crew program. We first ventured outside for a tour of the rear of the property and to see the pool area, the canal, and the second oldest tree on Long Island, all of which are found in the backyard of Stella Maris. Coach McCutcheon pointed out that adjacent to the property is the Seatuck National Wildlife preserve which will provide an interesting opportunity for our science and environmental programs. After touring the outside of the property, the team participated in the service portion of their trip. They cleaned windows, swept floors, and decorated the interior of the house for Christmas. The experience was a very fulfilling one for the whole team. It allowed the team to work together and be a part of something bigger than themselves. The team drove home and finished the night with an energetic practice, where everyone was in good spirits. This opportunity allowed a group of young men to enjoy themselves while helping others and building team chemistry that will be critical to a successful 2018-2019 season.